(Red Deer Life, October 28th, 2012.) 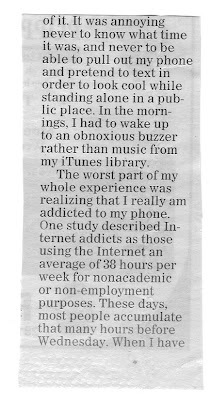 Shane Achenbach’s article is a revealing look into the world of iPhone addiction among high school teens. Putting the thing away for a whole week was a daunting prospect, he says. But he found the week so freeing of his time that he plans to bond less with it from now on. I am reminded of how epidemic this type of addiction is every time I step out the door or even look out the window. For some of us, thankfully, iPhone addiction has not entered our homes yet, except temporarily through visitors or tenants. Look around at the lives that are hijacked by gadget-addiction. See the lonely girl who wonders why she has no friends. But how may she meet any when she is always neck-deep into her iPhone? Notice the lonely boy, same problem. When he goes out he has the world turned off by the plugs in his ears! There are greater dangers than loneliness and isolation through this addiction. The next text you send might cause a car accident, injury, or death; it could cause your marriage to implode; it could cost you your job. These effects have all happened through addiction to technological gadgetry. 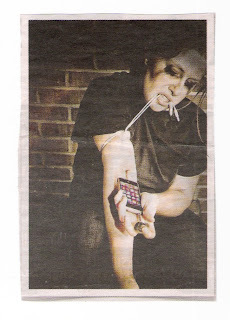 The best way to prevent an addiction like this is to not own the tempting gadget. One simply doesn’t need the thing. The next step is to limit your internet time to just a few hours per week. 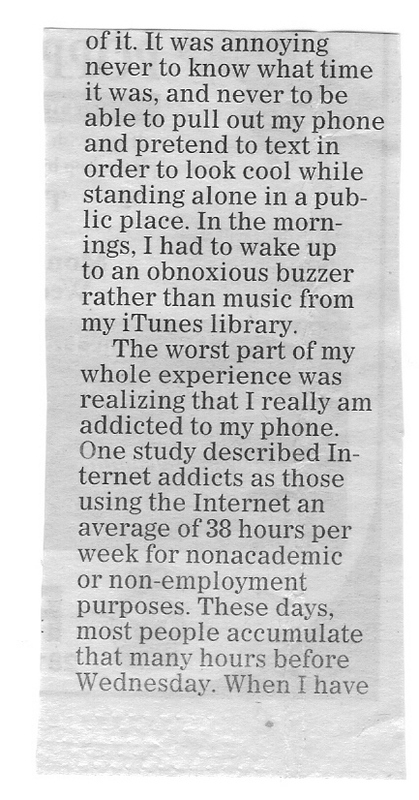 This puts a check, not just on internet addiction, but on addictions to internet sites. And then pick a day or even two, for total internet abstinence. Be conscious of this danger, though: once you go to sites you are prone to getting addicted to, your time quota will go out the window. This shameful lesson I have learned through experience. The absolute best thing to do, if practicable, is to limit yourself to public internet use. This will put the handcuffs on both your hours and your site addictions. Temperance is self-control over pleasurable actions that could turn into addictions. To be temperate is to be the master of your appetites. Show me a temperate man, and I will show you a man who has inner strength. The best example of such a man, outside the Bible and without the Christian sphere, may be Benjamin Franklin. A man may be a non-Christian and be very temperate, as his fascinating autobiography shows. Sadly, Christians today are not one tenth as temperate as Benjamin Franklin was. True, there exists much more to tempt us to distraction and addiction now than then. But the command in Scripture to be temperate has not softened with age and progress. There are few ways more obvious than gadget-temperance to show that a person lives in the real world and that he is a citizen of a Higher World. It is not a proof; but it may be a sign. Why not take advantage of such a noticeable witness to this dying world? I speak as though you are a Christian when I say this. You must make your inquiry about what you are. 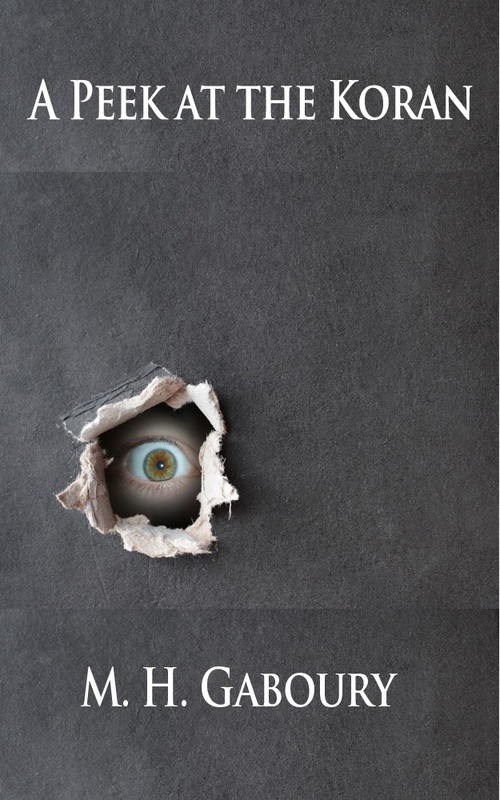 Chew on this food for thought: if you are unconcerned and not convicted about having an internet gadget for your continual cigarette, is the Holy Ghost, through a reception of Jesus Christ, really operating in your life? If he is not operating in you, you have never been operated on by the saving grace of God, you are still in your sins, and you are still on that broad way leading to destruction that Jesus speaks of (Matthew 7.13.) You are still, then, to put it bluntly, on the highway toward hell. Temperance is put alongside attributes like gentleness and peace as comprehending Spiritual fruit (Galatians 5.22, 23.) If you have no temperance, there is reason to doubt that you have the Spirit, which a reception of Christ certainly yields. In 2 Peter, temperance is put alongside faith, knowledge, and patience (1.5, 6.) If a person must check his gadget for messages continually, does that person have temperance and patience? If he has not those, does he even have faith? That text says that temperance and patience must be added to faith. Until that is done, then, how wise is it to presume that one has faith? Faith is the ground that temperance and patience spring from. If these flowers of faith are absent, it is likely that the root (faith) is absent as well. A person may exercise a kind of temperance and not be a Christian. But is he a Christian who is not temperate? It seems rather doubtful. When the apostle Paul had opportunity to address Felix, that tyrannical, unprincipled governor of Judea, “he reasoned of righteousness, temperance, and judgment to come” (Acts 24.25.) So much is temperance necessary to have that Felix ‘trembled’ for his lack of it. Paul knew that unsaved men are slaves to, not masters of, their appetites. Can a person be a slave to his passions and a servant of Christ at the same time? This is a question for every person professing to be a Christian, including myself. Passion-slavery, or gadget-slavery, is a mark of unbelief, if anything is. And ‘judgment to come’ follows intemperance as certainly as guilt follows sin. There are numerous examples in Scripture of what temperance looks like on the ground of life. Temperance is the apostle Paul keeping under his body (1 Corinthians 9.27.) It is the men not coming at their wives when commanded to abstain (Exodus 19.15.) It is Daniel tempering all that he did by injecting seasons of prayer into his day (Daniel 6.10.) Cakes must be tempered with oil (Exodus 29.2.) Otherwise they will fall apart and be of little use. The life that is not tempered will fall apart and be just as useless. When the right things are tempered together, when the sweetest things are compounded, the result is something pure and holy through which a divine meeting may take place (Exodus 30.34-36.) Jesus Christ is the sweetest compound: his divine-human person, his life, his works, and his death. The principal confection, or holy mixture, resulting from his divine-human work, so far as it concerns and benefits the sinner, is his righteousness. And that righteousness is for any trusting sinner to have credited to his account. You are a sinner. You must be justified. The righteousness of Jesus Christ may be credited to you through faith, and then meetings with the Godhead may be yours regularly and forever. To be justified by faith is to have the righteousness of Christ to your credit through your trust in his life of obedience and his willing, sacrificial, vicarious death. His resurrection is the seal that all that Jesus Christ the Son accomplished satisfied God the Father and can be beneficial to you. Then, for a person to experience a significant Christian life, he must be ‘temperate in all things’ (1 Corinthians 9.25.) Nothing proves a commonplace life more noticeably than addictions to gadgetry. To live significantly, and to have the appearance of it too, one must be temperate.